Roast Pork Loin a la Nottingham Drive | When I Survey . . . So my local grocery store had a sale on whole and half pork loins, and I thought what a great item for the rotisserie on my grill for Memorial Day weekend. But then the weather got weird, so I roasted this one inside in the oven, and I commend it to you. I used convection roast, and if you have that capability I recommend it, but this will work fine in a conventional oven. 1 3-4 lb. boneless or 4-5 lb. 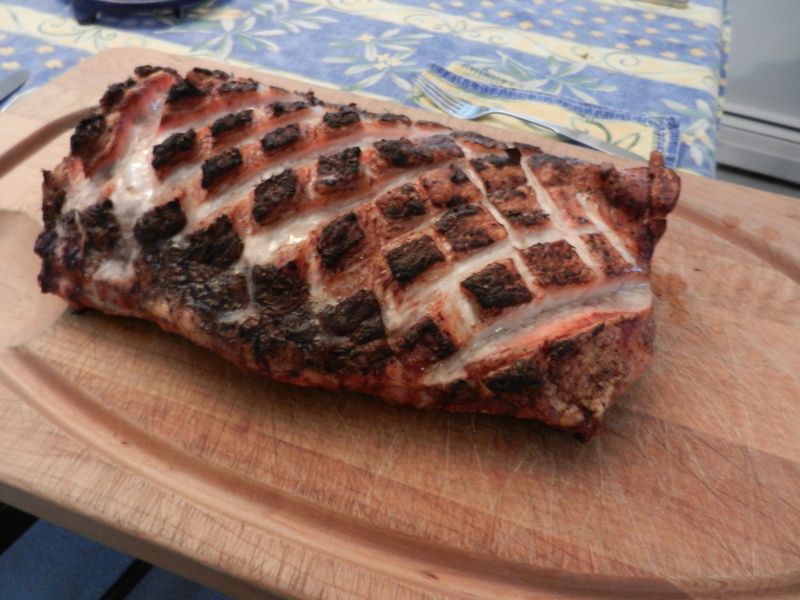 bone-in pork loin roast. Mix the spices together, and rub generously over the roast. Preheat oven to 425 degrees. Place the roast fat side up on a broiling pan (you are not going to broil it, but the broiling pan will keep the juices and fat from splattering better than an open roasting pan) Score the top of the roast with a sharp knife with shallow 1/2 inch diagonal cuts. Place the roast in the oven (if using convection roast on the bottom rack, if not in the bottom third of the oven). Cook at 425 for 15 minutes, and then reset the oven to 325 degrees. Cook to an internal temperature of 145 (if you like some pink) to 150 degrees (if you don’t) and let sit for 10 minutes before carving. Cut in straight thin slices like a jelly roll. Serve with baked beans and applesauce. We had a lovely Portuguese Dao with it, but any light red will do. This entry was posted in Recipes and tagged pork loin roast. Bookmark the permalink.